Oh, No! Not a Root Canal! Why not? Gainesville, GA has the dentist for you that is painless when it comes to root canals. This is a two part procedure. The first part Dr. Weber does is he cleans out the decay from the central part of the tooth, reshapes the canal and replaces it with strengthening filler, pain-free. The second part of the procedure is to have a final restoration, a Crown to cover and protect your tooth for many years. 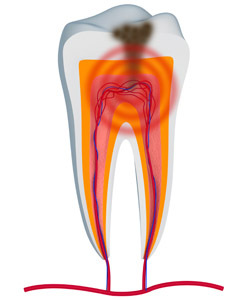 A tooth that becomes decayed and goes untreated is the cause. If the tooth is left untreated, this decay can burrow into the deeper reaches of the tooth, causing extensive damage to tooth structure. When the damage goes beyond what can be treated with a filling, dentists can perform a root canal (or endodontics), preserving the tooth and retaining its original integrity; thereby, saving a tooth. Remember, this is a two-part procedure and both procedures will save your tooth for many years to come. If you need a root canal, call or email us today to schedule an endodontics appointment with Dr. Weber in Gainesville, GA.